This shelving system starts simple: a wall-mounted wood display shelf. A few carved slots and added strips of felt, though, transform an otherwise minimalist storage solution into something new: a decorative but useful, adjustable and unique piece wall furniture that combines designer style with a a playful arts-and-crafts approach. 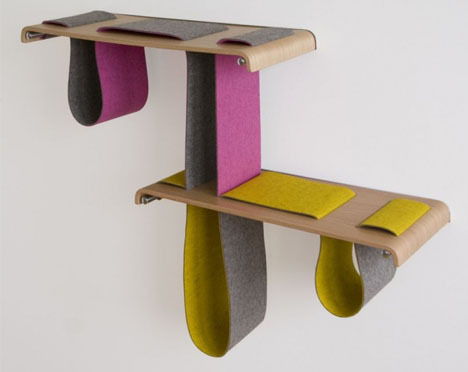 Looped through small slits in the shelves, hanging pieces of felt are suspended at (adjustable) levels to accommodate various under-shelf storage and display configurations. 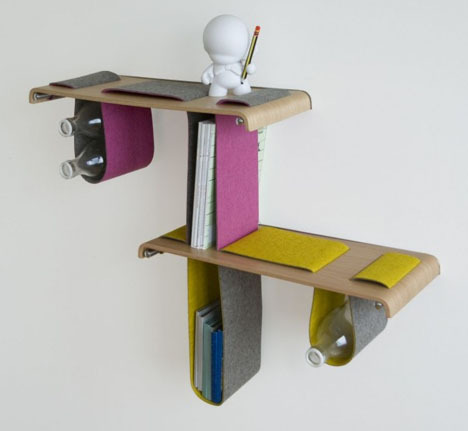 Beyond the basic flexibility concept, however, this Boa Shelf by Tuyo Design Studio is intentionally also modular – you could ’string together’ an entire series of one-shelf modules, endlessly connecting one, two, three or more individual wooden shelves with felt elements across a whole room and perhaps even around corners. 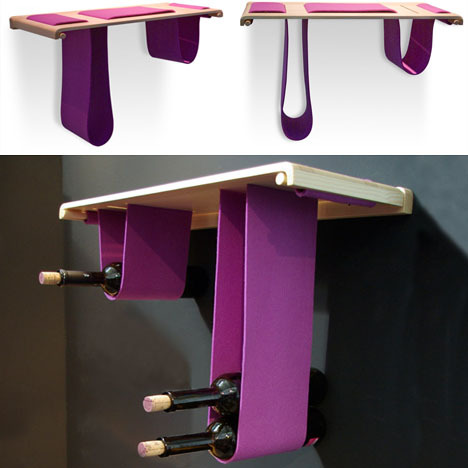 Naturally, their tendency to round at the bottom makes them a perfect fit for likewise curved objects such as wine bottles but they can also stretch in various ways to store and show off irregular decor as well, and their flexible height adds to the possibilities as well – the shape of the shelving system forever shifting along with its contents. If these units go into mass-production, however, it might be worthwhile to offer a more muted black-and-white alternative to such a bright purple-and-yellow color palette.